By stepping into the gleaming hallways of Yeshivah Darchei Torah on Wednesday morning, Betsy DeVos already made a powerful statement to promote school choice in the national debate. Mrs. DeVos may be the 11th education secretary since the position was established 38 years ago, but she made history during her two-day visit to New York by becoming the first one to visit a yeshivah. A member of President Donald Trump’s cabinet, she produced potent imagery during her visit Wednesday to Darchei and to the Manhattan High School for Girls the day before. When this reporter walked into Rabbi Deutsch’s fourth grade classroom, all 23 students immediately rose, remaining standing until I got to my place. Oy, I thought to myself, they think I am a rabbi. Presently, a female non-Jewish reporter entered the room. Again, the entire class rose in respect for someone older than them. It was a formidable lesson in chinuch and etiquette. It was also something that clearly captured Mrs. DeVos, a former longtime champion of school choice in her native Michigan who herself was in a yeshivah for the first time, according to an Agudath Israel official. The visit, more than a year in the planning, culminated a dramatic effort by Agudath Israel of America to showcase a traditional yeshivah schooling to the nation’s highest education echelons. It began during the confirmation process, when she was speaking to Abba Cohen and A.D. Motzen, Agudah’s Washington director and national director of state relations, respectively. Last Thursday, the education department gave the final OK on the visits, and Agudah gave the department a list of schools that would welcome a visit. The department independently looked into the schools and chose two — Darchei for boys and Manhattan High for girls. The schools were notified the next day, setting into place a scramble to prepare for their high profile guest, along with the security headaches that comes along with it. “Recovering,” responded one Darchei official when asked by phone later Wednesday how he felt. She appeared to be using her visits to advance a long-held goal of hers, to promote nonpublic schools to the level of their public counterparts. Earlier Wednesday, she spoke at a Catholic event in Manhattan, declaring that the anti-religion Blaine Amendment on the books of 37 states should be abolished. Darchei Torah, consisting of a campus of several imposing buildings and led by Harav Yaakov Bender, was a ready receptacle for beliefs. Established in 1972, it teaches nearly 2,300 students from preschool through kollel, with a world-renowned vocational program. They provide special learning programs for about 300 students. The myriad aspects were on display Wednesday, as Mrs. DeVos went from one classroom to another, flanked by Rabbi Bender and Ronald Lowinger, the yeshivah president, and followed by a coterie of aides, national reporters and cameramen. 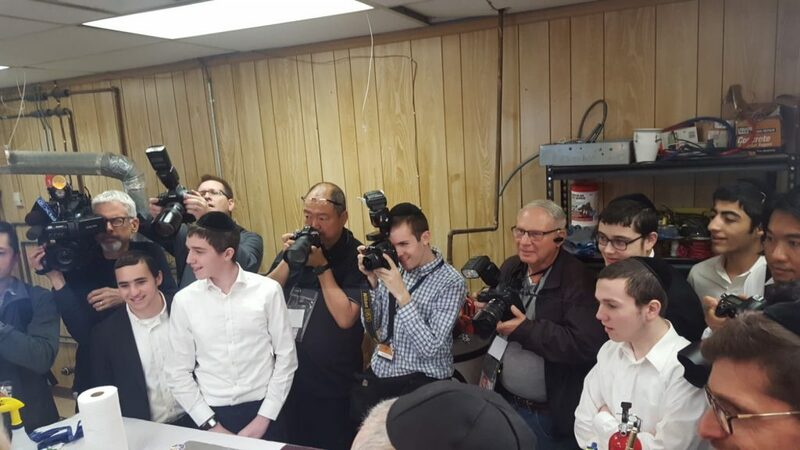 Rabbi Deutsch did an admirable job teaching about the order of the brachos with a scrum of 15 journalists and photographers recording his every remark. A tray of fruits and cookies lay on the table, near stalks of wheat and barley and the rest of the shivas haminim. He lined up seven boys, each taking one stalk in the other of its brachah. “Because we have to thank Hashem Who created it,” responded one boy. “Excellent!” the rebbi said, before turning to his guest and explaining what the lesson was involved. “I love your introduction and the way you use technology,” Mrs. DeVos told him. Mrs. DeVos then moved on to a poetry class. The teacher was discussing why poets put their thoughts to paper and how a poem must be read. The secretary ambled down the hallway, stopping into several resource rooms to greet a rebbi or teacher and their student before going into the wing housing the vocational program. Rabbi Moshe Lubart, who heads the program, explained briefly how it works before calling upon a bachur to demonstrate his knowledge. “First you clean the pipes,” said the bachur, who appeared to be about 16 years old, “then you put on the solder, then you make the solder stick.” He then powered a blowtorch, slowly blackening the copper pipe. Mrs. DeVos appeared interested in every detail, questioning the boys and praising them. “How beautiful!” she exclaimed at one point. A highlight of the visit came toward the end, when the secretary walked into the cavernous beis medrash, where a thunderous sound arose from hundreds of bachurim learning. Many hardly lifted their heads from the Gemara. Mrs. DeVos spoke to some of the bachurim about the chavrusa method, appearing fascinated by the concept. The secretary has a long history with yeshivah advocates, but offered a detail to Darchei staff on Wednesday that her husband’s Dutch great uncle and aunt had hid Jews during the Holocaust. She said she was very impressed with the students’ knowledge, and particularly with how yeshivos transmit the tradition from one generation to the next, a Darchei official said.